Looking for the best Vegetable choppers around? If you are someone who has been spending too much of time in the kitchen for slicing vegetables, then vegetable choppers are here for your rescue. These slicers are extremely handy for slicing vegetables and fruits in a jiffy thus saving a lot of your precious time. They can chop uniformly sized precise slices while most of the modern slicers also have an option to select the desired thickness. Some of the kinds of veggie slicers available in the market are electric vegetable slicers, non-electric slicer, spiral slicers etc. Here are the best rated vegetable choppers/ dicers that we have handpicked for you. World Cuisine A4982799 spiral vegetable slicer, can be used for slicing fruits and vegetables into ribbon-like, curly spiral shapes; it is ideal for fancy peeling of veggies; here is a brief review of the product. 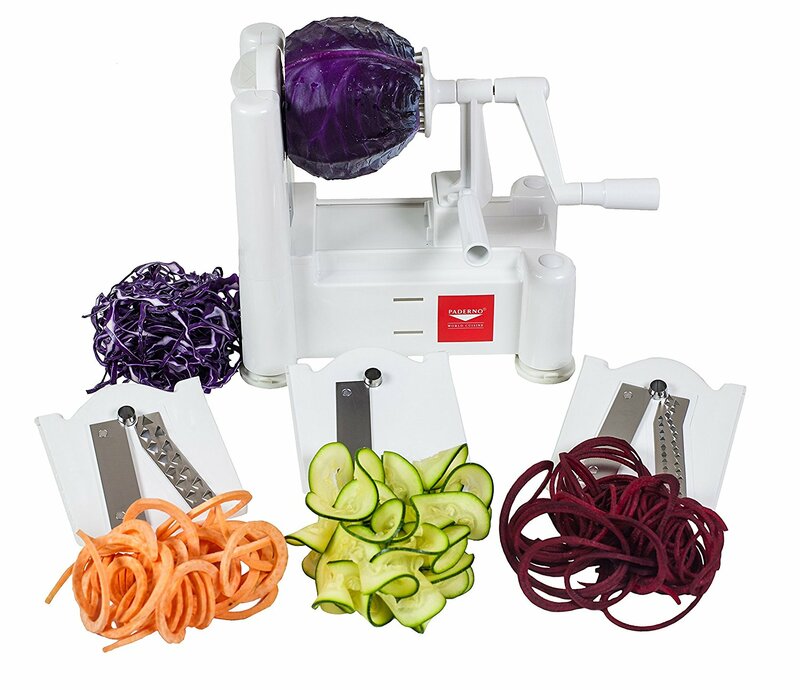 This spiral vegetable slicer from World Cuisine is made of durable plastic and comes with three sets of blades- straight blade for ribbon slices, 1/8″ spacing, and 1/4″ spacing. You just have to keep the vegetable on the wheel prongs and rotate the wheel by simultaneously pressing the base towards the julienne blade; that’s it – curled julienne slices and spiral strands are created continuously. The dimensions of the unit are 12 by 10 by 6 inches (Length x Width x Height). The product has good reviews from customers stating that it is worth the money invested; it has average rating of 4.5 stars out of five. This spiral vegetable slicer comes with a warranty of one year. One of the reasonably priced vegetable slicers, Swissmar Borner slicer V1001 is reviewed in the present post. Swissmar Borner slicer is an ideal tool to julienne and slice vegetables or fruits uniformly, safely and quickly. It is constructed with rugged plastic and measures 15″ L by 6″ W when it is assembled to be stored. This slicer comes with three inserts that can be used to lock in position. It also includes a safety holder that holds on to the food firmly with stainless steel prongs; this safeguards your hand from the stainless steel blades. While storing all the three inserts, the V frame, and a safety holder – all of these can be put into a caddy, which can be put away in a drawer or can be hanged onto the wall. Working of this vegetable slicer is fairly smooth, and it’s easy to clean too, since it can just be rinsed under running water. It includes 3.5 mm blade, 7 mm blade, and thin/thick slicing blades; it can also dice potatoes, tomatoes or shred cabbage. The device is ideal to prepare shoestring potatoes or French fries and also used to slice carrots, onions, potatoes, kiwi, firm tomatoes, apples, and many more. The instrument is designed for using over bowl or cutting surface. It features finger guard, comfort grip handle, ridges and non-skid base for stability. The cutting plates can expediently be stored beneath the device when not in use. This package also includes storage box. Bron Mandoline is perfect in handling vegetables, meat, and cheese, as well as slicing hard fruits like pears and apples. With multiple options for slicing, it is easy for choosing appropriate cutting method for your favourite recipe, whether it is for paper-thin sliced Gruyere, waffle fries, or grated zucchini. Manual operating levers help in controlling the thickness. Slope of the device is ergonomically-designed for additional comfort and a plastic guard protects your fingers from harm. Vegetable choppers and dicers allows you to quickly and easily chop up vegetables inside the kitchen. Vegetable choppers are usually small appliances and this make them easier to use than the standard kitchen accessory. Not only can vegetable choppers make quick work of onions, carrots or peppers, but they are also good in dicing fruits such as apples and tomatoes. Along with time and energy, using a vegetable chopper for onions will save you some tears and prevent you from itching if you are allergic to some of these vegetables. The success and popularity of the vegetable choppers is owed to the fact that this appliance offers these types of advantages. Another reason why vegetable choppers have become so popular is because of the influx of all these infomercials that can be seen on TV. One vegetable chopper, The Slap Chop, stands out as being of the most creative, effective and easy to use vegetable choppers on the market today. There are two types of vegetable choppers available today. The first is the manual chopper, also known as the hand chopper. The second is the electric vegetable chopper. Of course, the electric vegetable chopper has the advantage of being much faster and more efficient than the manual hand choppers. This is especially when you are preparing huge meals or you are in the restaurant industry where you are cutting a lot of vegetables. Unfortunately, the electric vegetable choppers cost a bit more than the manual choppers making a major trade-off between them. Professional restaurants tend to use heavy-grade stainless steel veggie choppers. These greatly reduce their prep time and makes the food look just a little bit better when it gets on the plate. Both the Vegetable Chopper and the Vegetable dicer can be used interchangeably for most vegetables as they are very similar kitchen devices. The vegetable dicer is used mostly for dicing onions and garlic and is designed in such a way that the diced bits fall into a container, or at least, most designs are like that. The convenience doesn’t end their however. The main advantage of a vegetable dicer is the speed at which it does the job. All you have to do is put the vegetables in the chopper and give it a moment to get the job done. Kitchen appliances like the vegetable chopper greatly reduce the amount of time you spend in the kitchen. Nothing does a better job of driving home this point than the countless infomercials on television that show off the speed and precision of vegetable choppers and dicers that are available on the market today. Vegetable dicers can be used to help make sandwiches or even to dice and slice pizza toppings. At dinner, vegetable dicers can be used to make the food smaller for babies so that it is easier to chew. The uses for vegetable dicers are endless to be honest. There are a lot of vegetable dicers and choppers on the market today, but here are a few of the ones that stand out the most. Vegetable slicer is one of the most useful appliances in the kitchen, especially for people who need to chop a large quantity of vegetables or fruits as a part of their daily chores. Professional chefs also prefer such a slicer as it makes their job easier. Hence, these slicers are ideal to be used in home kitchens as well as restaurants. They can be used to chop, dice, shred or slice vegetables, fruits, and julienne for use in salads or garnishing. One thing that must be mentioned here is that you will have to be very careful not to get yourself hurt while using a slicer. An electric vegetable chopper is highly advantageous over the traditional non-electric ones. Though electric slicers are a bit expensive when compared to the conventional ones, but easier to handle, thanks to the electric motor. They provide uniform slices even with vegetables that are high in water content like cucumber, onion, etc. And, of course, electric slicers are quicker compared to the hand-operated ones. Some of the best electric vegetable slicer manufacturers are Chef’s Choice, Presto, PRM, Waring Pro, Deni, to name a few. And, following are some of the best selling electric vegetable slicers in the market. Vitamix a3500 vs 750 Comparison – Which Is The Best?